After school care is available to MMES students through the Fountain Hills branch of the Boys and Girls Club of Scottsdale. FHUSD provides transportation to and from the Boys and Girls Club before and after school. This program is based on the Boys and Girls Clubs of America Five Core Service Areas. These core services include: Education and Career Development, Character and Leadership Development, Health and Life Skills, The Arts and Recreation, and Sports and Fitness. Please read more about the Boys and Girls Club. The Spanish language program is sponsored by the PTO. It requires a yearlong commitment by both the parents and the students. Spanish classes will be held on Monday and Wednesday or Tuesday and Thursday mornings from 8:00–8:35 a.m. There is tax deductible fee of $200.00. All students grades K–2 may participate. If you are interested, please contact the school at (480) 664.5200. Studies by major corporations and universities have shown that chess can help students increase their math and verbal skills as well as their creative and critical thinking abilities. We invite students of all grades and playing levels to join us on campus Friday mornings before school from 7:25 to 8:25 a.m. Space is limited, so register as soon as you can! Tuition for the club is $189.00 per semester. Coach Scott is available for questions after 5:00 p.m. at (602) 482.4867 or by email. Forms are also available at the McDowell Mountain office. MMES has created a rich and robust after school club that provides a S.T.E.M. experience for our third grade students. 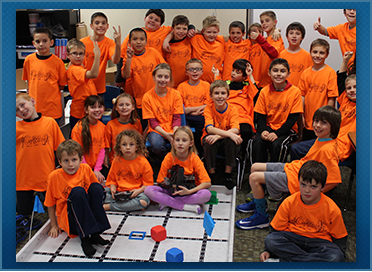 This club uses the Junior FIRST® LEGO® League (Jr. FLL) program combined with a VEX IQ Robotics program. These programs encourage children’s interest in science, technology, and engineering through real-world challenges to be solved by research, critical thinking, and imagination. The Jr. FLL component teaches the students how to make simple machines, and it provides hands-on materials to engage children in the activities. The VEX IQ component is more challenging, continues to engage the students, and builds on their technical skills. VEX IQ program teaches students how to build a robot for competition. Both curriculums will allow the teachers to model and mentor teamwork and communication skills. The registration fee for the club is $50 per semester. The fee helps subsidize the supplies and registration fees for the local competitions. The goal of the club is to attend two competitions per school year (one competition per program). We require parent participation at the competitions. MMES is fortunate to have Mrs. Cooper, Mrs. Wright, and Miss Thrasher to lead this club. The club will meet before school every Thursday from 8:00 to 8:40 a.m., starting on September 8, 2016. Lego will begin in February. Please call the school office for more information or to obtain a registration form.